Spoken word isn't about a handful of "great" artists who have lots of video views or publishing accolades; it's about how everyone has a story, and every story has value. In that spirit, I wanted to consolidate a few resources, links, and tips that I've shared with young (and not-so-young) people all over the country. If YOU are interested in spoken word (or poetry, writing, art, more generally), whether that means finding somewhere to share your work, getting feedback to sharpen your craft, or just being around poets and building community, here are a few thoughts. Feel free to add more in the comments below. The Be Heard MN Youth Poetry Slam Series (happens every January-March); a huge opportunity for MN youth poets to meet each other, tell their stories, and have fun. The ReVerb Open Mic (free, all ages; happens every Thursday night, year-round, from 6-8pm at Golden Thyme Cafe in Saint Paul); one of the most community-oriented, supportive open mics I've been to. There's also Button Poetry Live, The Free Black Table, the OUTspoken open mic, college slams, and much more. Here's the full list. Writing is about community. Many high schools and colleges have spoken word clubs, and showing up to those can be a great first step. If you’re a student and your school doesn’t have one, start one! It doesn’t have to be as formal as a club or student organization. What counts is community—maybe it’s just a circle of friends who meet up once a week to give each other feedback. Maybe it’s an online document that multiple people can edit. But getting feedback from other writers, having someone to bounce ideas around with (and not just trade Instagram likes)—that’s vital. Revision is 85% of the battle. First drafts are not ever as good as they potentially could be. Break out of the mindset that the poem is this magical, perfect thing that just bursts fully-formed from your head. Your peers, friends, and mentors can have a lot to offer. The deluge of poetry on Instagram and YouTube over the past five years or so has meant that there's more poetry than ever before, right at your fingertips. I'd argue that this is a good thing, but the flipside is that there's a lot of not-so-great work out there too. That's natural; that's fine. But it can make learning and growing as an artist a challenge: is the IG poem with ten thousand likes a "good" poem? Is your poem, that didn't win the poetry slam, a "bad" poem? What does that even mean? My big list of 100+ poems/videos for use by social justice educators. Button Poetry's channel, showcasing the most current work by current practitioners. An ongoing project of mine analyzing some new poems on Button's channel. The YouTube channels of YouthSpeaks and TruArtSpeaks, both featuring work by young poets. This is my website, so I may as well shout out my own videos, haha. In terms of books, there are too many great poets to shout out here, but a couple of presses that regularly publish work by poets who also participate in spoken word: Write Bloody, Button Poetry, Coffee House Press, Haymarket Books-- I could go on and on; feel free to add more in the comments. Lots of social media accounts share poetry; a lot of is bad. There are some, though, that regularly share good, curated stuff: @PoetryMagazine, @SlowDownShow, and Litbowl. Check out the VS podcast w/ Franny Choi and Danez Smith. Every April, TruArtSpeaks shares a daily writing prompt. Other sites, organizations, and accounts do this as well. Try to find some you like, and potentially try writing a 30/30 (30 poems in thirty days). TruArtSpeaks’ Flip the Script! Youth Writing and Performance Conference: takes place every February. TruArtSpeaks’ ReVerb Writing Circle: very first Thursday of the month, 4:30-5:30pm at Golden Thyme Café in Saint Paul. 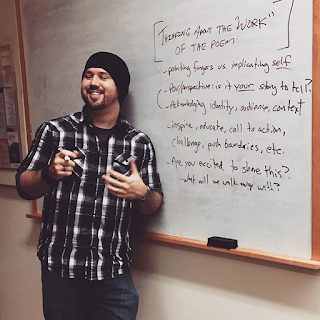 The Loft Literary Center offers multiple classes and workshop opportunities. Black Lines Matter presented by Black Table Arts. The weekly Well-Placed Commas workshop. If the opportunities in the last point aren't as accessible to you-- there are some good tools on the internet too. This video series is about sharing some of the ideas that have been helpful to me as a writer and performer. Honestly, when people send me their poems for feedback, 95% of the time, my feedback is based on video #2 and video #5. More videos on the way. 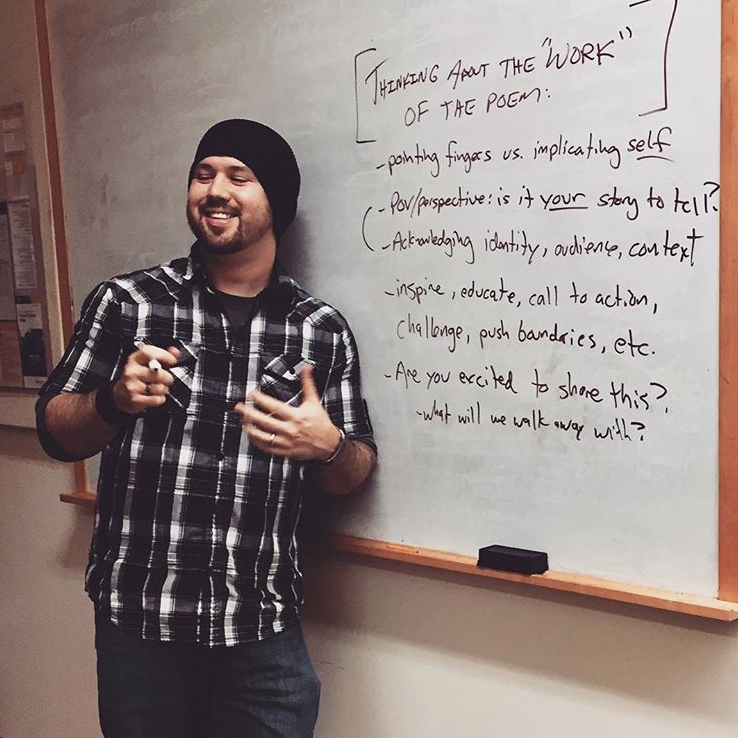 Spoken Word Performance Tips and a Note on "Poet Voice"
Even though my TEDx Talk isn't specifically about poetry, it does contain a lot of insight into my writing process and may be worth a watch. A running theme through all of these points is the idea that craft matters. Of course, if you're just writing poetry for your own healing or enjoyment, whether some other poet or critic likes it or not is beside the point. But if you're someone who is trying to make a career out of it, or really wants to find some measure of concrete success (book sales, publishing credits, a larger audience, etc. ), then I hope these links, thoughts, and resources can be useful. Writing is important, but the best poems don’t come from locking ourselves away in a cabin and just writing for 20 hours every day. They come from engaging with our community, showing up to things, experiencing the world, having conversations, organizing and rabble-rousing, thinking critically, and then writing. Have fun. Guante, thanks so much for sharing these resources. I hope to begin writing and this will be invaluable. A quick question, if you have the time... Is rhyming important? I wrote something last night and the lines rhymed... It seemed like I was forcing it a little. Hey-- that's a great question, and I would say NO, poetry does not have to rhyme. Rhyme is just a tool, and some poems use it while others don't. If you listen to any of my spoken-word stuff, almost none of it rhymes. So yeah, rhyming can be useful, or can be a challenge, but if you feel that the rhymes are forced, I'd definitely encourage you to take a break from rhyming and just write in a way that feels natural for you. Okay, I will try writing without and see where it leaves me - it's daunting trying to find a style, but I guess I've just gotta dive head-first into it. I really appreciate the tips and the resources Guante. I was wondering if you had any suggestions as to forums to share work, both written and spoken? As a single father it’s hard to get time for open mics. Also, I don’t know how you feel about it but I found Sarah Kay’s TED talk some what helpful and would recommend it to any aspiring artists. Stephen-- thanks for the comment. I wish I had more info regarding your question. I know people post poems all the time on social media, whether Facebook, Instagram, YouTube or whatever, and sometimes can even build followings doing that, but I don't know a ton about the strategy behind it. I would imagine that there are online communities/forums/reddits/etc. devoted to people posting their work too, but again, I just don't know a ton about that. Most of my experience has been in physical spaces. It's a great point, though, and I guess also overlaps with a larger question of traditional publishing-- finding poetry journals, magazines, etc. that intersect with your style/interest and maybe getting into the submission game. Wish I had more to share! I appreciate you sharing pointers and information about getting started in the Spoken Word world. I'm finally taking a leap of faith and sharing my words with the world, so I'm taking everything in! I've been writing for many years and I thank you for sharing!